The questions raised are from this news that the Podesta brothers provided documents right before they were subpoenaed by the corrupt Mueller gang are disturbing. Why did the Podesta’s decide to file the forms now? Were they tipped off by someone within the Mueller investigation to do so? And does anyone really think that Mueller will find the Podestas of committing any illegal acts after years of giving the Clintons and the Obama Administration a free pass on all their illegal activities? TGP by Joe Hoft: The crazy liberal Democrat mainstream media (MSM) created the unfounded and unprecedented hoax that the Trump campaign was working with Russia during the 2016 election. Although no information to date has substantiated this claim, the MSM is reporting non-stop about this since the election loss of their candidate Hillary Clinton. The Democrats and they’re ‘Really Fake’ MSM tried recounts which didn’t work and then they gave their all to the fake news Russia-gate story. At the same time, the MSM never mentioned the connections that the Clinton team, including John Podesta, her campaign manager, and the Clinton Foundation had with the Russians. The Clintons and their cronies took millions from Russia in exchange for US uranium and other future gifts, yet to be disclosed. We know the Clintons and anyone connected to them is corrupt. We learned this from the years of Clinton corruption and from John Podesta’s emails released shortly before the election by WikiLeaks. We also know that the Mueller investigation is phony because he is the textbook definition of a dirty cop. This is due to the fact that Mueller has connections to the key witnesses in the investigation (e.g. James Comey who leaked information to the press hoping to ignite the special counsel) and yet Mueller has not recused himself. He also has a history of not bringing any prosecutions to the high level cases that involved the former President Obama Administration and the Clintons. Also, all the people hired by Mueller are former Clinton and Obama cronies. The Podesta Group belatedly filed severalnew disclosures with the Justice Department on Aug. 17 related to work the firm completed between 2012 and 2014 on behalf of a pro-Russia Ukrainian think tank. Back in April, the powerful Washington lobbying firm run by Clinton ally Tony Podesta filed a document admitting its work for the pro-Russia European Centre for a Modern Ukraine may have principally benefited a foreign government. New disclosuresrevealed dozens of previously unreported interactions the firm made with influential government offices, including Hillary Clinton’s State Department and the office of former Vice President Joe Biden, while lobbying on behalf of the center. Embattled ex-Trump campaign manager Paul Manafort failed to disclose his extensive lobbying efforts on behalf of the center at the time as well. Anyone lobbying or doing public relations on behalf of foreign governments is required to register as a foreign agent in compliance with the Foreign Agents Registration Act. The Aug. 17 filings include short-form registration statements for six Podesta Group employees and an amendment to the firm’s registration statement that includes a list of political contributions made by relevant employees throughout 2013. A review of those donations shows both parties received cash from Podesta Group lobbyists. 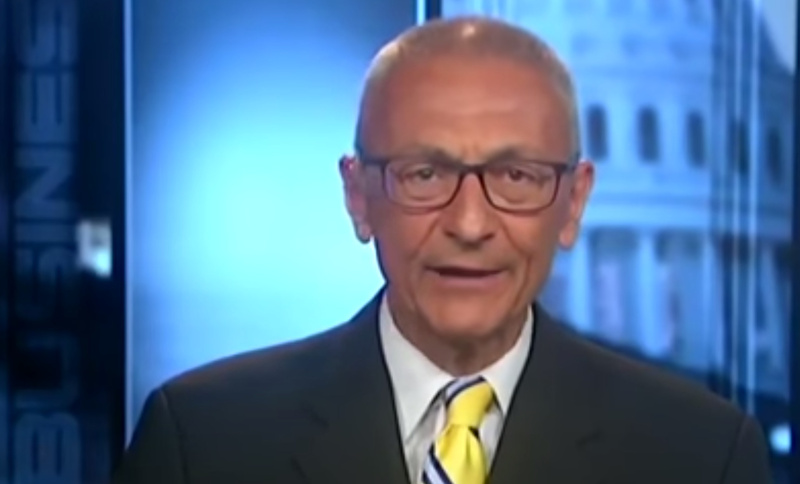 As previously reported, Fox News’ Maria Bartiromo invited former Hillary Clinton campaign chair, John Podesta as a guest to discuss his closed-door session with the House panel. Bartiromo did not disappoint! She slammed Podesta on his ties to the Russians. Bartiromo also brought up how the Democrats have stronger ties to the Russians. Podesta was visibly rattled as he struggled to defend his position. Bartiromo came out swinging in the interview and pointed out that it is the DEMOCRATS who have deeper and stronger ties to Russia. Of course, John Podesta came unhinged after he was actually asked a tough question by someone in the media and immediately denied it. The more Podesta pushed back, the more Maria Bartiromo slammed him over his lies and ties to the Russians. She even brought up Hillary Clinton’s Uranium One deal, selling 20% of U.S. Uranium to Russia while she was Secretary of State. We know from Podesta’s own emails that Hillary Clinton bragged about being invited to “Putin’s inner sanctum“. We also know that Podesta did exercise 75,000 stock options and as a result gained “75,000 common shares” as a result of being a member of the executive board of energy company, Joule Unlimited. We also know that Joule Unlimited received millions from a Putin-connected Russian government fund and that Podesta did transfer to his daughter, Megan Rouse, his shares of common stock in this company. We do not know the number of times that Podesta lied in his interview with Maria Bartiromo. This information was from an NBC article. In the original article, Podesta Group is mentioned 9 paragraphs down in the report. Special Counsel Robert Mueller issued grand jury subpoenas in recent days seeking testimony from public relations executives who worked on an international campaign organized by Paul Manafort, people directly familiar with the matter told NBC News. Manafort also was present at a June 2016 Trump Tower meeting with a Russian lobbyist and a Russian lawyer, along with Donald Trump Jr. and Kushner. NBC News has previously reported that Kushner is under scrutiny by investigators, and that Mueller is examining whether President Trump obstructed justice. The executive said six firms participated in the public relations effort that Manafort coordinated, paid for by a Brussels-based non-profit called the European Center for a Modern Ukraine. The stated goal was to build support for Ukraine’s entry into the European Union. Two of the firms, Podesta Group and Mercury LLC, worked in Washington with Manafort partner Rick Gates, according to lobbying disclosure records. Three other firms worked in Europe, the executive said. NBC News could not confirm the identity of those three.